Pour the stock and wine into a large, wide frying pan. Add the garlic, thyme, tarragon sprig and carrots, bring to the boil then lower the heat and simmer for 3 mins. Lay the chicken in the stock, grind over some pepper, cover and simmer for 5 mins. Scatter the leek slices over the chicken, cover again then gently simmer for 10 more mins, so the leeks can steam while the chicken cooks. Remove from the heat and let the chicken sit in the stock for about 15 mins, so it keeps moist while cooling slightly. Strain the stock into a jug – you should have 500ml (if not, make up with water). 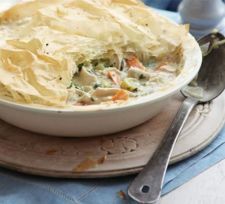 Tip the chicken and veg into a 1.5 litre pie dish and discard the herb sprigs. Pour the stock back into the sauté pan, then slowly pour in the cornflour mix. Return the pan to the heat and bring to the boil, stirring constantly, until thickened. Remove from the heat and stir in the crème fraîche, mustard, chopped tarragon and parsley. Season with pepper. Heat oven to 200C/180C fan/gas 6. Tear or cut the chicken into chunky shreds. Pour the sauce over the chicken mixture, then stir everything together. Cut each sheet of filo into 4 squares or rectangles. Layer them on top of the filling, brushing each sheet with some of the oil as you go. Lightly scrunch up the filo so it doesn’t lie completely flat and tuck the edges into the sides of the dish, or lay them on the edges if the dish has a rim. Grind over a little pepper, place the dish on a baking sheet, then bake for 20-25 mins until the pastry is golden and the sauce is bubbling. Serve immediately.